Park Dimensions; The park is symmetrical, measuring 330 feet down the foul lines, 365 to the power alleys and 400 to center. The fence is 14 feet high from left field to left-center, then eight feet high from left-center to right field. The stadium was designed to complement the architecture of the surrounding campus, and to evoke the aura of baseball’s historic parks. 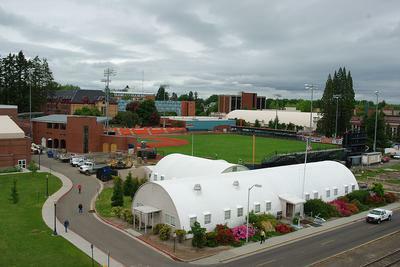 In May 2008, the Goss Stadium expansion project which consisted of extending the stadium down the 1st and 3rd baselines, was completed. This expansion raised the capacity from 2,000 to 3,248 spectators. The facility has hosted 8 NCAA Regional Tournaments (1952, 1963, 2005, 2006, 2011, 2013, 2014, 2017), as well as 5 NCAA Super-Regional Tournaments (2005, 2006, 2007, 2013, 2017). 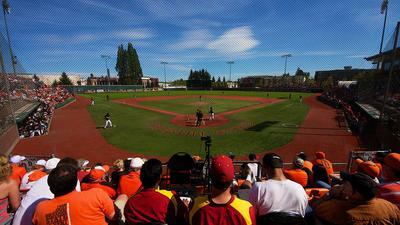 As of 2015, Oregon State has posted an impressive mark of 25–8 in postseason games at Goss Stadium at Coleman Field. The entire playing surface was converted to FieldTurf before the 2015 season. The infield-only was turfed from 2008-14. The Jacoby Ellsbury Locker Room complex, and the Banners hospitality area, were added for the 2015 season. Lights were added for the 2002 season. A new scoreboard, with video capability, was added in 2007. A brand-new scoreboard with enhanced video capabilities was added for the 2016 season. The field was established in 1907, with the first game being played on April 12, 1907. Coleman Field, is yet another of America's Oldest baseball parks that to lay claim to being the oldest continuous ballpark in the nation. 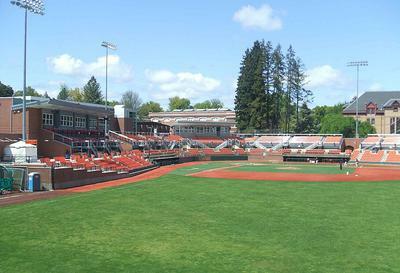 OSU is proud of the fact that it is the location of a ballpark built more that 100 years ago. With that pride came the dedication to preserve what they felt was a national treasure. The stadium has undergone several renovations and upgrades to keep pace with the speed of play of its growing student body. 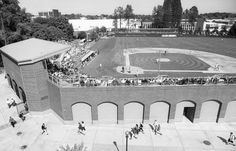 Coleman Field has hosted championship contests going back to 1907. In you are in the area take a break and go watch a Game. Coleman Field is a great venue for Baseball.